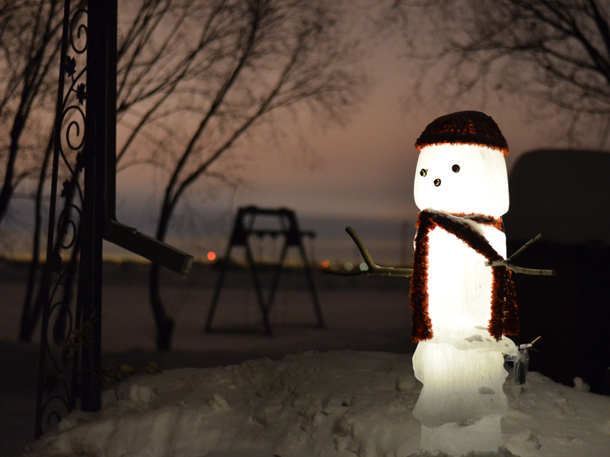 Nighttime view of the ice-man. Jan 2014. For the last few years, my nieces have given their grandma a very unique and very special gift for Christmas. Huge icicles form at my brother-in-law and nieces' house and, once they get really big (like 4 feet high and a foot or so thick), they carefully break off the huge icicle and begin carving a snowman out of ice. My 9- and 10-year old nieces used a drill to make holes for the stick arms and then they found a few bolts from their dad's garage for eyes and a nose. And, to make this ice-man really stand out, they lit him up from the inside by driling holes up his back and placing a set of battery-powered LED lights inside like an icy spine. Luckily it stays well below freezing for most of the winter so this ice-man has a season-long lifespan. Alice is really going to have to step it up with her Christmas gifts to Grama to compete with the creativity of this gift! That's so cool! He looks super rad, and especially so when illuminated. What a clever and fun way to use those giant icicles! The snowman is so cool! What creative nieces you have.